UPDATE: There are now detailed instructions (including photos) for the first 8 rounds of this pattern on my blog here. Part 2 of the detailed instructions is here. Part 3 is here. Please let me know if anything is still unclear. You are, of course, welcome to just use the recipe below, as ever! This is the method I used to make my Pink Flower Baby Blanket and it makes a very effective 3D fabric which is just the right size for babies to grab without catching their fingers (that last being the reason I didn’t do Irish crochet rose petals). My father pointed out it makes a good surface for stacking balls on! sc in first stitch, (dc, htr) in next stitch, 2tr in next stitch, dtr in next stitch, 2tr in next stitch, (htr, dc) in next stitch. Repeat all the way around. End with sc in last stitch to end petal. In the round increases should be made on the plain crochet rounds. I amn’t very good at working out where these should be, but try to keep them even. If these petals are being done in rows back and forth do the petals in the front loops of the right side, then the plain crochet in the front loops of the wrong side. 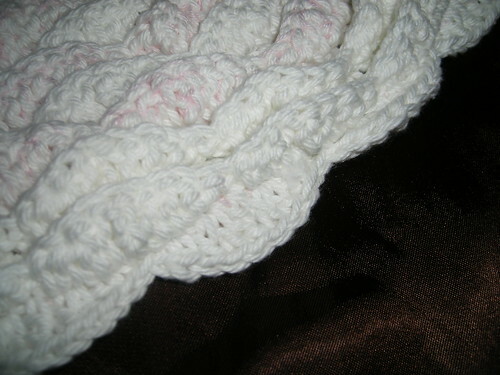 If making a blanket or similar, end on a petal round in both loops. Row 1: sc across, if you don’t already have both front and back loops available. Row 2: (right side) All in front loops *ss in first stitch, (sc, hdc) in next stitch, 2dc in next stitch, tr in next stitch, 2dc in next stitch, (hdc, sc) in next stitch. Repeat from *. End with one ss to finish last petal. Row 3: sc across remaining loops of every stitch of Row 1 increasing as necessary. hi! What would this pattern look like if using crochet symbols? Neat pattern! Glad you like it! That’s a good question about the symbols – I’ll have to try to work it out sometime. I haven’t yet written up more than what’s here, and can’t do so right now, but I’ll try to do so next week, if you care to check again then. Sorry I can’t be more helpful right now! I was checking to see if you had a chance to write the pattern. Have you had a chance to write the pattern. This is beautiful. I would love to make one. hi! I don’t blame you about the heat, we sure had a summer. Now it’s cooling off to almost chilly here. I kept an eye out for your pattern(s). Great looking petals. On the Crochet Party group on Ravelry.